Welcome to Kimberly Oaks Estates Livonia Michigan information web-blog written by local real estate agent Bob Jakowinicz. The purpose of this web-blog is to give you a brief overview of what the area has to offer. If you have any real estate related questions or concerns please feel free to contact us at BobandTeena@Yahoo.com or 734-578-6561. 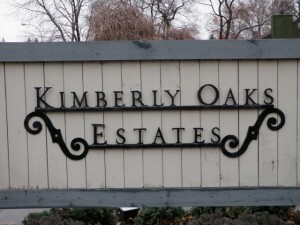 Kimberly Oaks Estates is located at Lyndon (just south of 5 mile) and Farmington Rd in mid-Livonia Michigan. The city of Livonia is 36 sq. miles in which Kimberly Oaks almost falls right in the middle of the city. With just under 700 homes in the neighborhood there is sure to be something for everyone. From the moment you pass the warm welcome sign (seen on your left) you will notice a tremendous sense of pride in home ownership in this area. The homes are well taken care of and there just seems to be a nice feel to this community. If convenience is what you are looking for you have come to the right place. Everything you need is close by including St Mary Mercy Hospital, Livonia Recreation Center (walking distance), Ford Field and Eddy Edgar Arena, I96 Expressway (be downtown Detroit in 25 minutes), Laurel Park Place Mall, Livonia City Hall, Livonia Library and much more. Kimberly Oaks Estates is located within the Livonia Public School district. The high school the area high school age kids will attend is Livonia Churchill unless other arrangements are made. Feel free to use the interactive map below to view the area as if you were there in person. Just use your mouse to guide your way through Kimberly Oaks and enjoy.